Pocky is brilliant. It's chocolate on a stick - it doesn't get on your hands and the stick is edible loveliness. What isn't to love. I found this new euro version in Waitrose just before Christmas and decided it looked worth a shot. 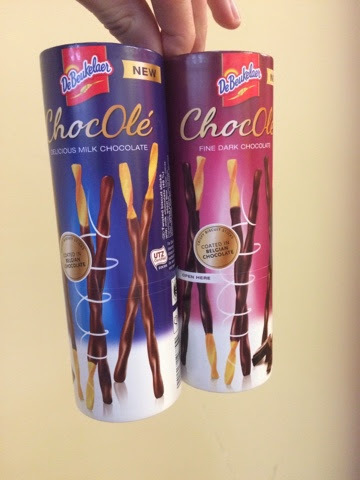 The main differences are that the chocolate is genuine top quality Belgian choc and the sticks are a bit twirly. The box is also a bit special - you rip off a tab and the whole top comes off - ace! Then you struggle to get the top back on to put them in your bag, and the top just slides off again. Not ace. This design however is perfect for a party, sharing in the cinema and other occasions but I can't help thinking I'd maybe like a pocket version too. Or a tab that slots in to hold it on. The chocolate is also noticeably thicker than your normal Pocky but falls off quite easily too - the stick isn't as textured as the Thai original so some topping will be worn accidentally on the lap. The milk version is very creamy and was loved at the tasting sessions by the Dairy Milk crowd. I preferred the dark choc version, but it didn't knock my socks off. Those who were not Pocky aficionados at the table liked them best. I've had Man Pocky/Pocky Dark so know the true power of the bitter sticks of doom. These are very very impulsive snacks and an open box soon gets finished, and I'm glad to see more companies exploring this space. With the current trend for all things exotic I'm continually surprised that Glico don't just dump a load of real import Pocky with one of the major supermarkets. 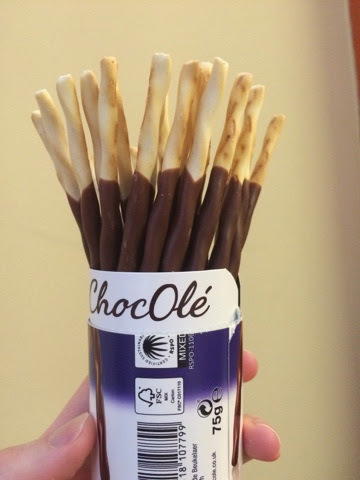 Sure - this has much higher quality chocolate, but the sticks aren't anything special so it becomes a novelty snack. I'd try any new varieties they bring out in a heartbeat, but for my everyday needs my local oriental grocers sell Pocky pretty cheaply. Pocky addiction is real.